This record was not planned but it just happened during the preparations for the first Enfant Terrible label night in Bruxelles 2008. Wermut does not need much of an introduction. The duo has produced some of the finest and best electronic songs and sounds of the past few years. They were present on the Enfant Terrible productions Electronic Renaissance and Hoera! Een Hex voor thuis! and they already performed several times at Enfant Terrible events. So, it might not come as a surprise this is one of my personal favorite bands from the last few years. 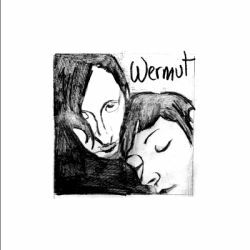 On this 7″ Wermut serves you two intense and melancholy songs. These songs are from the archive (recorded in 2003) but more then worthwhile to be made available at last. Both are addictive: one for the dancefloor and both for listening at home in good companion. This is all you might expect from Wermut at their best! Please note: at the time of the production and the release of this record Enfant Terrible had no knowledge of the fact that the track ‘Away’ had an origin any other then the Wermut studio. Only after I was contacted in August 2009 by a visual artist who told me he took part in the production of which Wermut took a sample to built their track I discovered this. Of course I apologize to the people involved in the original piece for using this without asking them for permission and for using it without any reference to the original piece on the record. ‘Timewaster’ is a Commodore 64 ‘demo’ released by the collective ‘Focus’ on 24 November 2001.